Supply Chain Management student Rani Ramchandani and other Bauer students served Thanksgiving meals during Thanksgiving Superfeast at the George R. Brown Convention Center on Nov. 22, 2012. Editor’s note: This story is part of a series called “Bauer Gives Back,” which will run through the rest of the Fall 2012 semester. With weekly updates each Friday, Bauer Gives Back will highlight volunteer activities and charitable efforts of students, staff, faculty and alumni of the college. Every November, the smell of turkey, stuffing and sweet potatoes fills the air as families prepare their Thanksgiving meals. But for a large group of the Houston population, affording such a feast is a challenge. That’s where volunteers in the community, including many students from the C. T. Bauer College of Business at the University of Houston, come in. Rani Ramchandani, a supply chain management sophomore at the Bauer College, volunteers her time each year during the Thanksgiving Superfeast at the George R. Brown Convention Center, serving up turkey and sides to families. She also helps children at the event pen letters to Santa Claus, in preparation for the upcoming holiday season. By reaching out to the Houston community each year, Ramchandani says her ultimate goal is to give back and hopefully make an impact. 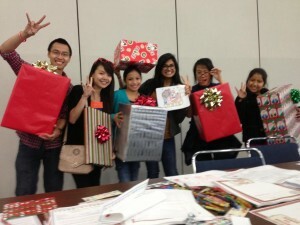 The next installment of Bauer Gives Back will be posted on www.bauer.uh.edu on Friday, Dec. 14. Do you have a suggestion for someone who should be recognized? Email Director of Communications Jessica Navarro at jnavarro@bauer.uh.edu.